JUGGLER is a word game, played on a table with a special deck of 70 alphabetic cards (one letter per card, with a score value - E is worth 1, J is worth 8 ...etc). 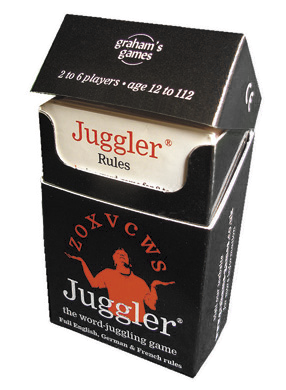 The Juggler card deck actually consists of two decks, one of 22 vowel cards with red backs and faces, the other of 48 black consonant cards. A game comprises several ‘rounds’. At the start of each round, each player is dealt a hand of just seven black consonant cards; the remaining cards are placed face down on the table as two decks (one red, one black). Players play in turns around the table in a clockwise direction. By a process of drawing one card and discarding one card per turn (rather like Rummy - more details on next page), your aim is to build the best-scoring word you can in your hand at the end of each round. The end of a round is determined when one player declares. ‘Declaring’ means that you announce to the other players that you have turned your whole hand into a word (thus having no leftover cards). You may declare as soon as you have done this (ie. at the end of your turn). As the declarer, you will be hoping to catch the other players with some high-value leftover cards, as this will increase your chance of scoring the most points for the round. The declarer does not show his cards when he declares; after he has declared, everybody else has just one more turn in which to make the best of their hand. When play comes back round to the declarer, all the players then reveal their hand of cards, announcing their word for that round. Each player scores the total face value of all the cards he has used for his word (MINUS the total face value of any remaining unused in his hand). The scores for each round are recorded on paper and when any player’s running total hits 70 or more, the highest total wins. You can only play one word per round - any other cards you have left over at the end of the round count as negative points against you, so you need to decide which word gives you the best score. However, a rather nice feature of Juggler is that the player who declares doesn’t necessarily score the most in that round.